This is the second of a six-part series by City Manager David Neeley based on his 2011 State of the City Report. One of the biggest stories in 2011 was the unprecedented drought and relentless heat that affected the state and placed an ever-increasing strain on utility systems statewide. Fortunately, due to the hard work of our Electric Utility and Water Services operators — and conservation efforts — the city survived the summer relatively unscathed. College Station Utilities hit an all-time summer load peak of 204 Megawatts on Aug. 28 and weathered several ERCOT emergencies without any significant system failures during the extreme heat. Water Services broke the historic monthly usage record in July and broke it again in August with more than 708 million gallons used. Prior to 2011, the highest monthly usage recorded was 600 million gallons in July 2009. Despite this, no new record for peak day usage was set and Stage 2 of our Drought Plan was never implemented. Following several years of construction and some dispute, the Twin Oaks Landfill operated by BVSWMA, Inc., was opened in June, becoming the first LEED (Leadership in Energy and Environmental Design) certified landfill in operation in the country. The $20 million landfill will serve College Station, Bryan and the surrounding area for upwards of 100 years given current projected usage. As our community continues to grow, we must plan and be prepared to meet projected needs and opportunities. As the University Drive corridor has continued to develop, the need for a new fire station became apparent. After much community engagement and planning, the city broke ground in September on Fire Station No. 6, which will be an urban, full-service station housing three companies, an engine, ambulance and ladder. It is anticipated that the station will serve our citizens in North College Station for the next 50 years and beyond. CSU completed the Dowling Road Substation, which has added capacity and provides reliable service to the high growth area in West College Station, and is now planning for the construction of the much-needed Northgate Substation. Water Services completed the Wastewater System Master Plan to identify rehabilitation, upgrades and future infrastructure, ensuring customer satisfaction and allowing for future growth. Additionally, the sewer line included in the Wellborn Service Plan is moving into the design phase and is on schedule to be completed within the required four-year window. 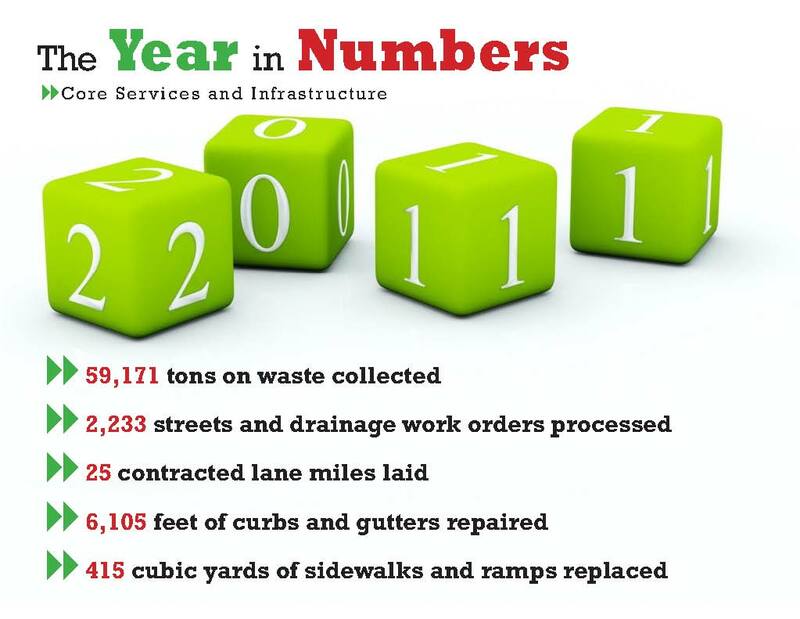 Public Works and Capital Projects initiated or completed numerous projects this year, including Water Well No. 8 and its collection line, Phase II of the Barron Road widening, Tauber and Stasney utility and street rehabilitation, Southwood utility and street rehabilitation, expansion of the Dowling Road Pump Station, and improved drainage for the Emerald Forest Creek Improvements project, to name just a few. Changes to state law accentuated the importance of groundwater rights throughout the state. Staff worked with our Austin consultants during the legislative session to gain favorable amendments to Senate Bill 332 to help ensure the future of our water supply. The city also partnered with the City of Bryan, Brazos County and Optim Energy to support the implementation of Senate Bill 737 in a manner that will not compromise existing well permits. Staff and our citizen representatives will continue to vigorously defend the city’s current and future water needs and permits before the Brazos Valley Water Conservation District and state legislature, while advocating the rights of historical permit holders in Brazos and Robertson counties. College Station continues to be one of the safest communities of its size thanks to the diligent work of the Police Department, which for the first time in quite a while has many positions filled through the recruitment and hiring of 38 individuals, 15 of whom are sworn. The department has also begun to realign its staffing system to the squad format, which has re-established accountability for officers, more closely defined the chain of command and improved morale while still maintaining the principles of geographical policing. Additionally, the city successfully negotiated and approved a new contract with the Brazos Animal Shelter that increases accountability and transparency, and secures the best possible rate for the next 10 years. In terms of statistics, we saw a 38 percent decline in robberies as well as a 17 percent decline in aggravated assaults, and through the hard work of our patrol officers and awareness efforts, we had a 19 percent reduction in alcohol-related accidents. In regard to high-profile cases, our officers worked with the district attorney’s office to secure two capital murder convictions and within 24 hours cleared and arrested the suspect in the lone homicide that occurred. The Parks and Recreation Department had a banner year in terms of the facilities and programs that are offered to our residents, and has proven yet again that our parks are a primary reason people choose to live in College Station. Parks and Recreation’s accomplishments are headlined by the completion of the much-anticipated G. Hysmith Skate Park, which opened to much fanfare in September. Wolf Pen Creek Park broke its previous event and attendance records as there were 38 events with an estimated 69,215 people participating in Duck Jam, World Fest, the Starlight Music Series, the inaugural BCS Marathon and the very popular Christmas at the Creek, which was moved from its previous location in Central Park. Finally, to maintain our current service level, it was recognized that a plan was needed to address future needs, maintenance and facilities. This resulted in the completion and adoption of the first Parks and Recreation Master Plan, which will serve as a guide post for the next several years. I’ve said on numerous occasions that residents and visitors to College Station are served by a highly-talented and well-equipped city staff. However, if we as an organization are to retain the best and most highly-qualified people, we must take care of our workforce. This is why we offered performance-based increases as a part of this year’s budget and continued implementing the third phase of the step plan for the Police Department. Additionally, we have improved our supervisor training program and have provided more than 547 hours of training to 115 employees, improving their skills and performance. The Human Resources Department has also worked diligently to implement the new online benefits enrollment program and coordinated numerous employee events that focused on skills training, health and wellness. Living and operating in the rapidly-evolving digital age requires that we remain at the forefront of changing technology. In 2011, we continued the expansion and improvement of the city’s fiber optic network, completing several significant projects including the Graham Road replacement, upgrade of Fire Station No. 3, rerouting fiber around the Wellborn Road and Old Main grade separation project, and expanding fiber to Tauber and Stasney, Fire Station No. 6 and Royder Road. In September, College Station Utilities began construction on the CSU Dispatch Center as part of its multi-year plan to renovate the Utility Service Center and meet the North American Electric Reliability Corporation’s physical and cyber security requirements. We were very excited to learn that after a site visit conducted in December 2011, the American Public Works Association will recommend that College Station’s Public Works and Water Service Departments be fully accredited. This will make us only the fourth city in Texas and the 78th nationally to obtain this certification. Public Works and Water Services will join the Police and Parks and Recreation departments as being accredited by their respective national organizations. This entry was posted on January 31, 2012 by City of College Station. It was filed under City Manager, Public Communications and was tagged with core services, infrastructure, state of the city report.